Six dollars. This is what had the internet boiling yesterday. Six dollars a month, or just less than 20 cents a day. As someone in my Twitter stream raged: "Here's a quarter...now shut up." But for the thousands of Netflix subscribers upset about the decision by the content-streaming-and-DVD-mailing company to raise rates, no one has that many quarters. A reporter for the Greeley, Colorado Tribune tweeted, "I don't know how the person who wrote that Netflix press release gets to keep his or her soul." A Midwestern theatre professor tweeted, "Netflix from awesome and hip to evil and draconian in one day. Congrats, you just lost the Internet." How evil and soulless is the move? Not very, say some who agree with the writer of the Netflix release (for the record, it was Jessie Becker, vice president of marketing, who executed that feat of positive-speak) that it's not exactly a price increase, depending on how you use Netflix. Those who currently pay $9.99 a month for unlimited streaming plus "unlimited" DVDs (though you can only have one out at a time, so your DVD consumption is limited by the realities of the U.S. Postal Service) can now choose between $7.99 a month for streaming only, or $7.99 a month for DVDs only. This, says Becker, is a way of "offering our lowest prices ever" in order to "provide great value to our current and future DVDs-by-mail members." Up until Tuesday, there was no DVD-only option.Though most of my friends are more likely to use just the streaming option, evidently many Netflix customers never used it, making this new pricing, indeed, a better deal. As Rick Aristotle Munarriz points out, "Roughly one-third of its 22.8 million subscribers aren't taking advantage of the Web-delivered video offering." NPR's All Tech Considered blog points to different reasoning: This isn't to pacify the technophobes, and it isn't to raise money. It's to save costs by encouraging more consumers to switch to the much-cheaper streaming option. If you can give up one or the other, you'll save a few dollars a month (maybe you can give it to your shocked friends who need both services and will have to pay $15.98 a month if they're currently subscribed to Netflix beginning September 1). But back to the original question of my post: Is Netflix still worth it? Many of my friends use Netflix as a cable TV alternative, watching TV and movie content on their computers instead of the archaic television set. Others use it in conjunction with basic cable as a substitute for the old way of doing things: renting movies from Blockbuster or a smaller local video chain. As a result of Netflix, in-store movie rentals have fallen to 27% of the overall movie rental business. As with everything, the answer is, "It depends." Back in the day when Blockbuster ruled the movie rental market, I spent far more than $6 or $7.99 or even $15.98 a month for movies. We would constantly rack up late fees and often ended up spending $25 or $30 a month for four or five movies, half of which I ended up disliking. I think we can all agree on this: In-store video rental is a bad idea. So here are four options for movie and TV watching that friends I know use, and love, and would cost less than Netflix -- if you do it right. 1. The library (free). Our local library system, like most American libraries these days, offers a huge selection of DVDs and, if you're old-school, VHS tapes for free. You'll probably find very similar offerings to those streaming free on Netflix, and you'll be able to watch them on a regular TV without any special equipment other than the old-school players you used when Blockbuster was a blockbuster. Since it's local, you won't have to wait for the mail to arrive, and most library systems allow many DVDs to be checked out at once (also free!). 2. Hulu plus TV and movie network sites (free). When we went for a stint without cable TV, I got comfortable using Hulu and TV network sites to watch my favorite shows. 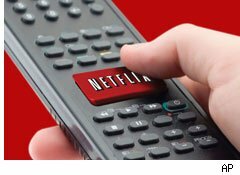 While there are more commercials than Netflix, there are far fewer than on network and basic cable channels, and if you're really allergic to them, you can just mute the screen for sixty seconds. Plus, you have all the benefits of TIVO -- watch any time, rewind, watch several recent episodes in a row in a delicious marathon of instant gratification. You might lose something in the way of available content, but hey, it's free. 3. iTunes plus the two above options (99 cents and up). A friend I know doesn't have cable. Years ago, he and his wife bought an iMac, hooked it up via a cheap cable to their TV set, and watch programming via Hulu and iTunes. TV shows can be purchased per episode, and the vault is pretty enormous; movies can be purchased or rented for a variety of prices. If you figure you watch two or three movies a month with Netflix's via-mail service, you would spend a bit more than $7.99 renting them on iTunes, but you'd be able to do it whenever you wanted, and not just when the mail arrived. Each week, iTunes offers a 99 cent rental. This week, it's Harry Potter and the Deathly Hallows, Part 1, a timely choice that I'll be ponying up for this very day. 4. Second-run theatres and free movies in your community (free and up). I've been wanting to see The Social Network forever, but I haven't wanted to pay the $4.99 it cost for Comcast's On Demand, and I don't have Netflix. I'm glad I waited: It's scheduled for one of my city's free outdoor showings at a nearby favorite park this summer. I also love seeing movies on the big screen at The Bagdad, a great local theatre that shows second-run movies for $3 or so a showing. From movie nights at pubs and coffee shops to PTA-sponsored movies at elementary schools, there are a bunch of ways to get your movie fix and a little socialization, too. 5. Redbox kiosks (99 cents and up). You know about Redbox, I'm sure -- it's everywhere. The movie choices are limited, but the price is right. For the price of Netflix (which ends up getting you three or four movies a month, if you plan it right), you could watch eight movies a month. Of course, you'll have to return the movies on time or face stiff penalties, so this option is not for the absent-minded. So is Netlfix worth it? Only if you're frequently watching content that's not available elsewhere -- and you must have that content -- and, with the DVD option, if you're getting and watching more than two movies a month in the mail that are new-enough releases to not be easily available in the library or on cable. What if you have cable as well? It's just not worth the $72 or $144 a year, in my opinion. Pick the free movies the are available on demand or on the channels you've got. You'ill survive, and you can put the money you would have spent into living a life better than the one you see on screen.